All given values are exemplary! The interface ID NEW may be replaced by a proper ID, e. g. TAMS-MC or RedBox. The interface to which MC is connected can be selected in the drop down list and is written into the field Port, e. g. COM4. The type is fixed to tamsmc. With this parameter the data transfer rate is configured. 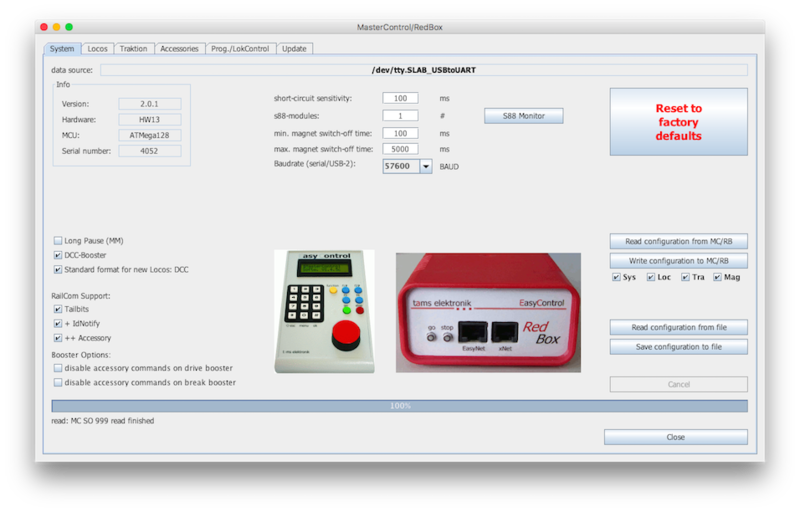 The controller supports values of 1200, 2400, 4800, 9600, 14400, 19200, 38400 or 57600 baud. If an USB interface is used, 57600 baud are used exclusively. Configuration of hardware flow. Use of CTS is recommended because the controller supports CTS flow control. 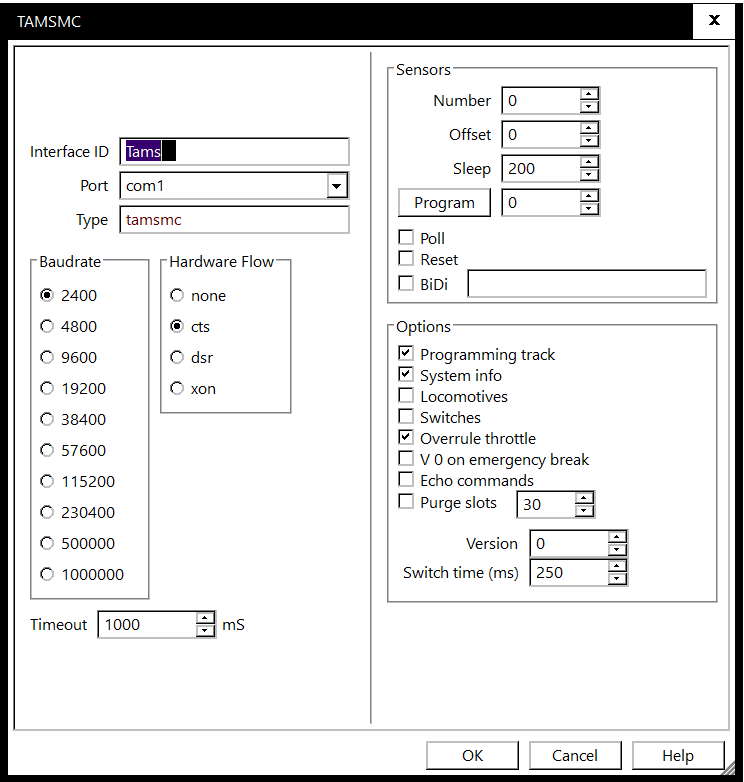 Only deactivate flow control in case it is an USB connection and the USB driver does not support CTS. This parameter configures the max. length of delays which, as the case may be, Rocrail has to consider between commands to the controller. In case commands to the controller get lost ("Error on mutex, trywait …"), raise the value to 4000 ms. In the sensor part one can set the number of connected s88 modules and how to scan for changes (Polling). Define here the number of 8 port connected modules. Some modules have 16 ports, so you have to multiply it by two in that case. In case of using p50 it is necessary to enable event polling. P50x does not support unsolicited events. If the number is set to zero, no sensors are polled. In case the option "Poll" is deactivated Rocrail scans regularly if the controller has sent changes of sensor states. The time between these scans (sleep) can be set here. Setting this flag will poll for sensor events every 200 ms. Since Tams MC supports the p50x protocol, with which sensor events are transmitted automatically, this option should be deactivated! The new introduced tamsmc library has implemented the programming track instruction in the p50xa format. The PT mode must be set in the programming Tab before reading/writing CV's. This will stop polling the s88 to avoid read CV read errors. Do not use this mode in automatic mode because it blocks sensor events and system status which will lead to accidents. With the Send button the decoder setup can be stored in the MC/RedBox. The decoder definitions are listed up in the CV-Navi utility. With the CV-Navi Tool the MC and RedBox can be configured and maintained. The switch time of switches or solenoid-operated switches can be set in the Tams MC itself (see manual). The effective switch time value is configured in Tams MC, not in Rocrail properties: For single switch commands the maximal switch time is used. If more commands are sent consecutively (e. g. set of train route), the minimal switch time is used. In MC the switch times are configured to min. 200 ms and max. 500 ms. In Rocrail the switch time is configured to 100 ms, the route switch time is set to 10 ms. If only one switch will be set, the actual switch time is 500 ms. If a route with a couple of switches will be set, the actual switch time of a single switch is 200 ms. In Rocrail the switch time is configured to 250 ms, the route switch time is set to 300 ms. If only one switch will be set, the actual switch time is 200 ms. If a route with a couple of switches will be set, the actual switch time of a single switch is 200 ms. There is a delay of 100 ms (300 ms - 200 ms) between the switch commands. The switch times should be configured advisedly. As the case may be the minimal and maximal switch time has to be set to the same value in the MC. In case the Route switch time in Rocrail is considerably shorter than the minimal switch time in the MC, it may happen in layouts with switches without position detectors that a train starts before the route was set completely and properly. Init field pause should be set to twice the value of (two switches at initialization!) minimal switch time in the MC. Too many commands in a short time period may lead to complications with Tams MC (as with other controllers), which show up in error messages "error on mutex trywait" and occasionally lost commands. Init field pause: At least twice the value of switch time configured in MC. Route switch time: See chapter switch time example 2. Block init pause: Same value as switch time or as route switch time. Skip switch commands in routes if already set: Activate option. Skip signal commands if already set: Activate option. Synchronize routes: Activate the option as the case may be, so that no more than one route is set in same time. Question: Tams MC is in modus STOP and EMERGENCY BREAK is pressed, Power is switched on and MC shows HALT on its display. Why is the power switched on? Answer: In modus STOP power is switched off completely. In modus HALT power is on track, but all driving positions are set to 0. Thus all locomotives come to a stop. This characteristic complies with DCC norm.